Just a quick note up front that today’s post is a little data heavy, so if you’re still adjusting to this weekend’s time change; be advised. A few weeks back Jim Urban wrote a post entitled ‘Against mulch’ on the Deep Root blog. The principle reasons he cited for his position were: 1) Mulch floats and can clog drains and releases “lots of phosphorus” as it breaks down, and 2) work by Gilman et al. 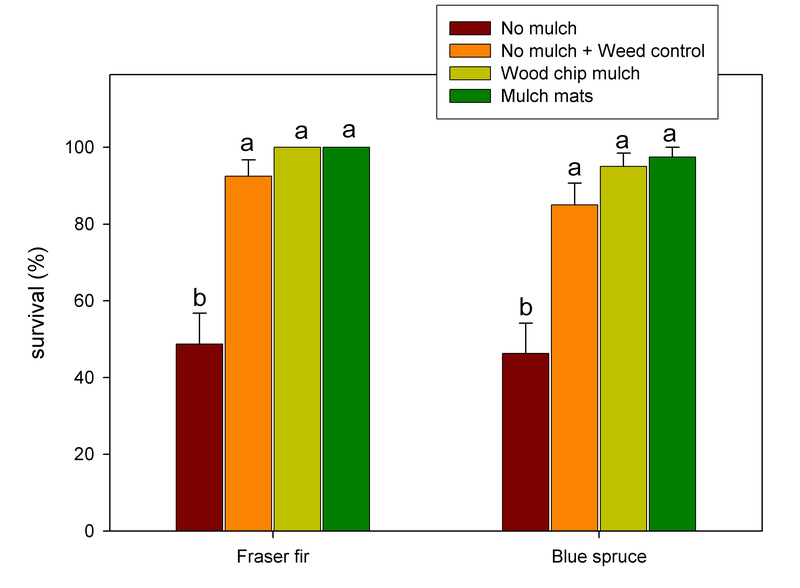 that suggest that mulch does not reduce evapo-transpiration. We discussed the Gilman et al. paper ad nauseum here already so I’ll stick to the other points. Most organic mulches float, it’s true. However, if mulch is repeatedly washing from a bed into a drain this suggests a problem with the design as much as anything. Second, I’m not sure what constitutes “lots of phosphorus”. Branch and stem tissue of hardwood trees is about 0.1% P. If we use just the bark as mulch, the P concentration is about 0.2 to 0.3%. Is that ‘lots of phosphorus”? I don’t know. I suppose if you put enough it down and allow it wash into a drain it could be. So let’s stick to what we do know about landscape mulch. Linda has written the most comprehensive review of mulch out there and it demonstrates the benefits of mulch. Nevertheless I’d like to add some recent observations of my own to the discussion. These come from follow-up measurement on some studies that we have already published on shrubs and conifers. But I think our new data are important because they demonstrate the long-term benefits of much on tree and shrub growth. 2006 Conifer study. In 2006 we installed a trial to compare several different weed control strategies for newly planted conifers. Weed control, either by hand, Vis-pore mulch mats or 3” of coarse wood chips, dramatically increased tree survival. 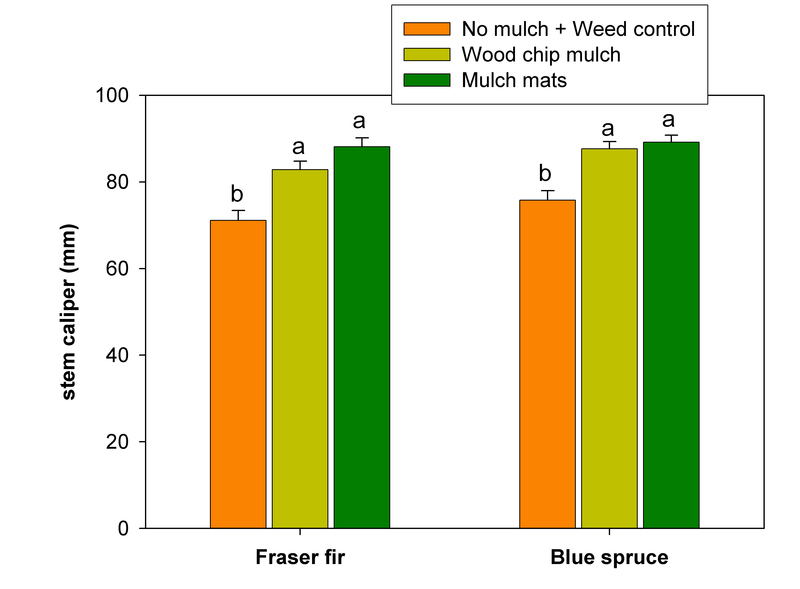 After 8 growing seasons, trees that had the wood chip mulch or mulch mats had significantly greater caliper than trees that were not mulched. 2004 shrub study. 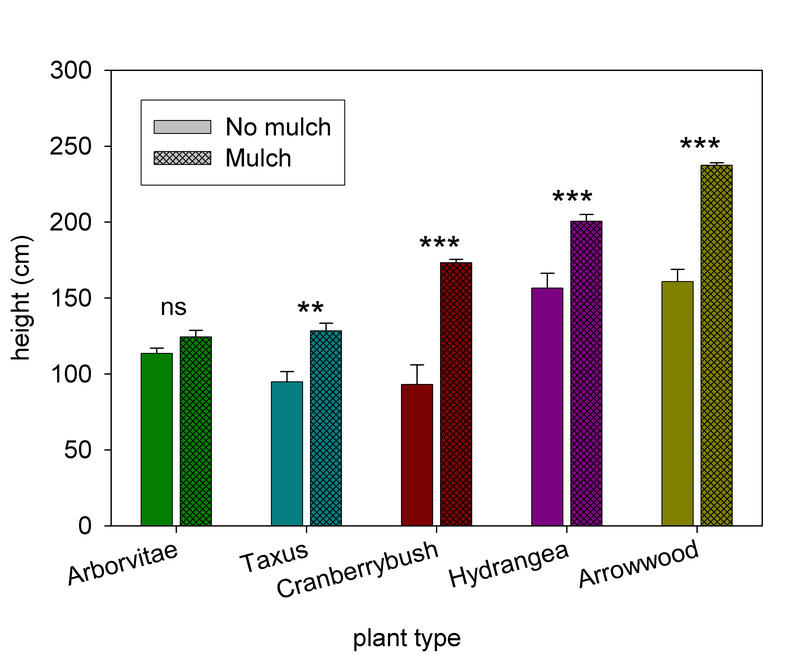 In another trial we compared the effect of various mulch types (wood chips, pine bark, hardwood bark) on growth of common landscape shrubs (golden globe arborvitae, Runyan yew, ‘Tardiva’ hydrangea, cranberrybush viburnum, and arrowwood viburnum). We re-measured heights of the shrubs study a couple of weeks ago (nine growing seasons after installation). To keep things simple here I’ve lumped the mulches together and simply compared mulched vs. un-mulched. After nine years mulching increased height growth for all shrubs except the arborvitae. Even more interesting is that the growth benefit of mulch extends beyond the establishment phase. If we start at age 4 and look at the relative growth rate for the past five years (i.e., growth increment for past 5 years / height at 4 years) we see that mulch continues to provide a growth advantage for all shrubs except the arbs. As I said at the outset, a little data heavy today but I think this is an import point. There is a lot of discussion these days about proper planting techniques but I think after-planting care often gets overlooked and mulching is an important part of that. That’s why I’m for much. Bert, thanks for this considered rebuttal. I think most people would agree with you about mulch. I’d love to hear you and Jim discuss this in person sometime. Any chance you are going to the ASLA show in Boston next weekend?! No, I’m not. Jim and I are on a few programs coming up (Michigan Nursery and Landscape Association EXPO and Minn. Nursery and Landscape meeting), but I think we’re always scheduled opposite each other. Maybe we can have a discussion during another ISA panel. I’m sure it would be an interesting discussion. Maybe we can collaborate on that for a future ISA panel, as you suggest. There are many folks around here using stone as “mulch”. I know all the reasons why this is not a good idea but do you have any studies that show similar growth results? Its a struggle sometimes to inform clients all the reasons bark mulch applied properly is better. Most of the arguments against rock or gravel mulch are anectodal or based on intuition (doesn’t add organic matter, rocks can become wedged or embedded in bark as trees grow and expand). Linda cites a few papers in her review that indicate rock mulches can conserve soil moisture but don’t improve plant performance as well as organic mulches. One thing that those against mulch often fail to mention is preventing lawn mower and string trimmer injury to the base of trees. A mulch ring is a great way to keep equipment from hitting the tree week-after-week. Aside from the other wonderous benefits of mulch, that’s one of the top reasons I recommend it. I agree. Lots of good reasons to mulch – see my earlier post. I think the arguments against apply to specific situations and are the exceptions not the rule. What about leaf mulch? I wonder if results would be at least similar if not greater? Leaf mulch would need to be reapplied at greater frequency though? I love mulch as much if not more than the next guy, but I was wondering if any of these studies were done in dry environments. In Reno, where I live wood chips seem to last forever and it has been shown (also in the Great Basin) that wood chips tie up the soil nitrogen making it unavailable to your plants. I was just wondering if this is also true in wetter environments or if the cycle is just so much faster that it doesn’t matter. Our experience with trees and shrubs is that the ‘nutrient tie-up’ from mulch is perception more than reality. We certainly haven’t see it our studies – just the contrary. 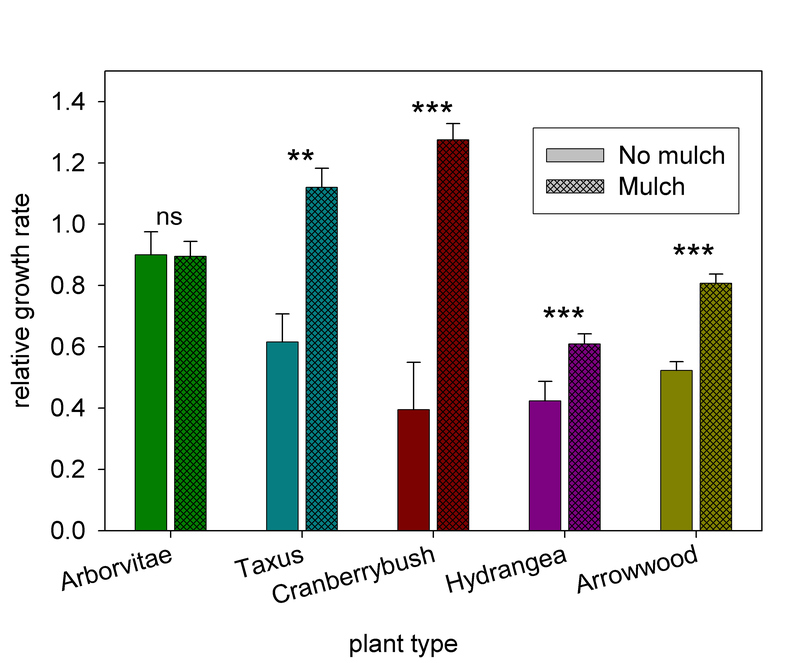 If you look at the Cregg and Schutzki paper (‘shrub’ link in the post above), leaf nitrogen concentrations were as high, or higher, with mulch as without (Table 5). In Linda’s review (see link above) most published papers showed the same result. There are a couple of cases were the nutrient ‘tie-up’ issue is real. We can see reduced nutrient uptake in annual bedding plants when they are mulched – this likely due to their restricted rooting depth. Also, nursery growers in some parts of the country are experimenting with using ground trees (including wood) instead of ground bark as growing substrate for container-grown trees and shrubs. Since these whole-tree substrates have higher C:N ratios than standard bark mixes, growers have to increase their nutrient additions (usually by ~20%) to get the same growth and plant quality. Aside from these cases, most of the evidence I’ve seen indicates that mulching has no effect or a positive effect on plant nutrition. As always, if you know of published papers that contradict this, we’d like to know about them. My information comes from the ecological research rather than horticultural. In the Great Basin, cheatgrass is an invasive species that is particularly problematic in high nitrogen environments. Ecologists us sugar addition (short term) and wood chip addition (long term) to tie up nitrogen so that native species can become established (with mixed results). Clearly peoples gardens are different from semi arid rangelands, but it seems like the same principle should apply. Maybe the levels of nutrients and moisture available mask any effect? My interpretation from horticultural studies is that there is a relatively small ‘zone of influence’ where high carbon mulches may tie up nitrogen. This why bedding plants with fairly shallow roots may be impacted but trees and shrubs typically are not. In terms of the ecological studies, I haven’t seen the papers but it seems like there would be so many confounding factors (changes in soil moisture, soil pH, changes in physical characteristics of the seed bed, etc.) it would be hard to sort these out and say it was nutrients. In our studies we seen completely different assemblages of weeds develop on the plots depending on the type of mulch we used. For example, with cypress mulch we have grasses but almost no broadleaved weeds; with the other mulches, it was the opposite -broadleaved weeds and few grasses. I haven’t tried to ferret out the cause but nutrients would be pretty far down the list. Thanks Bert, that makes sense. Cheatgrass is an annual grass. The presentations that I have seen directly measured a decline in available nitrogen, but it was shallow (and temporary) because they were interested in annual plant competition. You observation about the different weed assemblages is really interesting. Hey Bert! Great post! I found it very informative and thought provoking as a groundskeeper. I have one question: In the studies described, did you do a single application of mulch at planting and no more, or did you follow up in subsequent years with further applications? Good question. We only applied mulch at the start of the studies. For the landscape shrub study we applied 3″ of each mulch and that was it. We had two treatments that were no mulched: with weed control and without. We kept the no mulch + weed control plots clean for the first three years by hand weeding and some direct sprays of Round-up. That was the “official” end of the study. I basically forgot out the plots and did not do any further mulching or weed control. I was out by the plots recently and was surprised by how well the mulch had held up and how much better the plants looked in the mulched plots – that’s we I decided to go ahead and do the re-evaluation shown in the lower two graphs. The conifer plots (upper graphs) were also only mulched once. In that case we mulched individual trees with 3-4″ of ground hardwood trees. Oh, wow – that’s actually pretty amazing! I would certainly expect to see those kind of results with follow-up applications of mulch, but to see those results with just one application sure makes me more of a believer than I already am. Thanks for the details! Previous Previous post: We’re baaaaaaack…scary plants and all!